1. Place kale in a large bowl. Drizzle in the lemon juice, oil and salt. Mix it all up with your hands (no cheating! ), working the lemon juice and salt into the kale leaves until the colour begins to darken and the leaves wilt (around 5 minutes). 2. Add shredded beet to kale, toss to coat beet in dressing. Top salad with raisins and almonds before serving. Oh my I do love a good raw kale salad… and with beets! Never had kale with beets before! Excited to try this. You’re more than welcome to bring your vegan goodies to any of my parties! This looks great. PS now that you know about raw beets, you’ll have to try a beet slaw! I made one last year that we really liked. Well, given how super sweet Rob is, I can’t imagine that his family could be any different! I’m sure they loved everything you made! I’ve been meaning to try massaged kale and I think you’ve inspired me to stop procrastinating and do it. The salad looks delicious! I love all these ingredients, what a healthy and delicious dish! I love beets AND kale! This is a must-try salad for me 😉 Thanks for sharing! 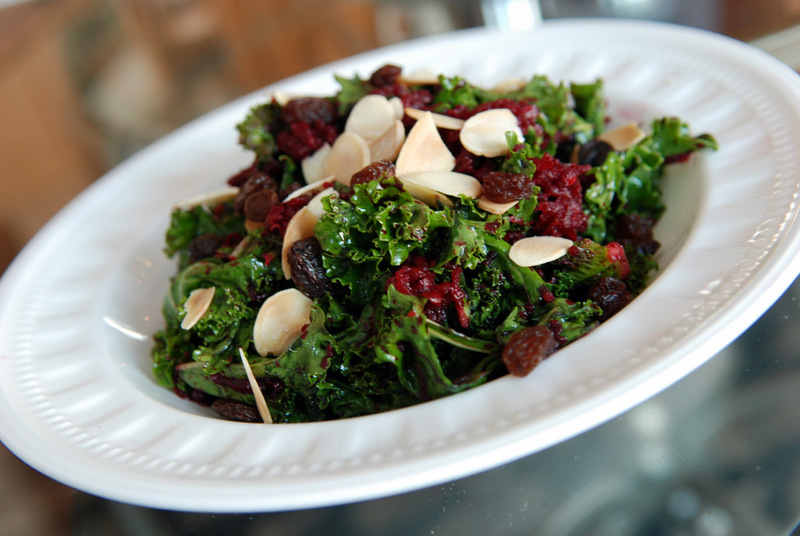 I’ve still never tried a raw kale salad, but I am certain I would love it- especially with beets and cranberries! I’m so glad you like this salad! The picture looks so delicious! And good tip about holding the stem/greens of the beets to avoid purple hands, haha 🙂 Also, if you get beets with fresh looking greens still attached, you can even eat those in a salad or as steamed greens! I love this salad. I’ve made it a few times already. Try cranberries to replace the raisins. I’m assuming this is the salad that you were telling me about that your mom loved and shared with people? I must try it! I have recently discovered the deliciousness of massaged kale when I made the raw Asian kale salad from the 2 week wellness solution. I love sauteed kale but I didn’t know you can eat kale raw. I thought the leaves would be too tough.